Description: What are the moral and ethical dimensions of stem cell research? What should our attitude be? Is this a promising discovery of ways to make life better and longer, or another attempt at making God in our own image? Are some types of research ethical and others not? The Author, Gerard Magill, PhD, holds the Vernon F. Gallagher Chair for the Integration of Science, Theology, Philosophy and Law at Duquesne University‘s Center for Healthcare Ethics in the McAnulty Graduate School. Definitely a great resource for you and for those you are trying to reach! 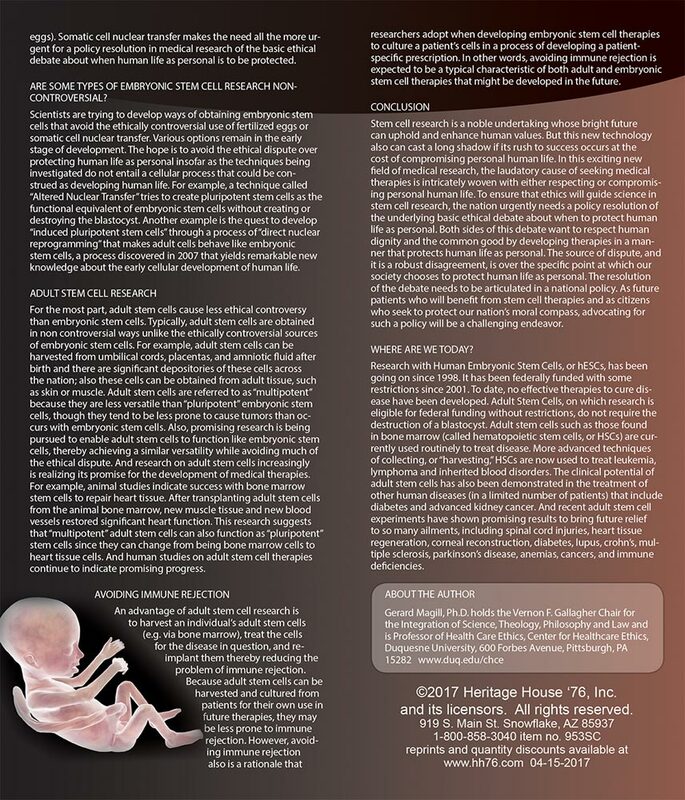 This brochure is thorough and will give you a solid understanding of Stem Cell research, but is definitely better suited for an adult or more mature reader. It is especially nice for those who wish to have a more scientific than religious approach to pro life issues, which is a plus when you don't know the religious views of those who stop by at fairs and whatnot. The Truth about Stem Cell Research is an excellent resource for anyone who values life. It explains the different types of stem cells and how they can be beneficial. It also delves quite deeply into the ethical issues involved. I like how it uses real scenarios involving real people to explain the moral issues involved. This important information is unlikely to come from the medical community nor the media. Thank you for making it available. 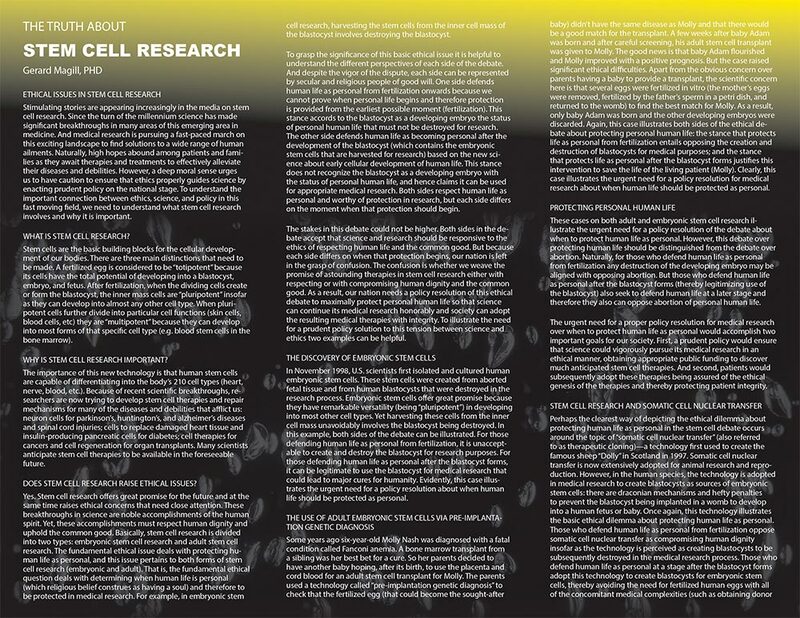 This is the best brochure I have found on the topic of Stem Cell Research. It is very thorough in its explanation. My only complaint is that if you are using this for Youth, there are a lot of words and not many pictures. 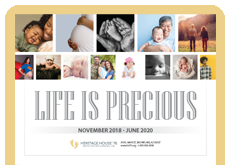 When this brochure is placed on a table with other pro-life pamphlets, the cover photo attracts people's attention. This is a great pamphlet for adults who want to better understand stem cells! It is thorough and goes into the right amount of detail to be understandable without being overpowering to the reader.